Charles Eames, Jr was born in St. Louis, Missouri. When he was 14 year old, he attended Yeatman high school and later Charles studied architecture at Washington University in St. Louis on an architecture scholarship. After two years of study, he left the university because his views were “too modern.” At Washington University, he met his first wife, Catherine Woermann, whom he married in 1929. A year later, they had a daughter, Lucia Jenkin. In 1941, Charles and Catherine divorced, and he married his Cranbrook colleague Ray Kaiser. Then later he moved with her to Los Angeles, California, where they would work and live for the rest of their lives. In 1940 through 1947, Kaiser and Charles helped Arts & Architecture magazine’s “Case Study” program designed and built the groundbreaking Eames House, Case Study House #8, as their home. In the 1950s, the Eames continued their work in architecture and modern furniture design. In the beginning 1948, the Eames furniture has usually been listed by Charles, later Herman Miller bound catalogs, and only Charles’ name is listed, even it had become clear that Ray was deeply involved and was an equal partner with her husband in many project. The most popular the Eames fabrics were mostly designed by Ray, as were the Time Life Stools. In 1979, Royal Institute of British Architects awarded Charles and Ray to get the Royal Gold Medal. Charles and Ray’s interest in photography went into the production of short film. In the film, their cinematic work was an their outlet for ideas, a vehicle for experimentation and education and such as collecting toys and cultural artifacts on their travels. Some of their other films cover more intellectual topics, like covering the purposely-mundane topic of filming soapsuds moving over the pavement of a parking lot. In 1970 to 1971, Charles Eames gave the Charles Eliot Norton Lectures at Harvard University. At the lectures, the Eames viewpoint and philosophy are related through Charles words. Charles’ last project was the Eames sofa when he passed away on August 21, 1978 from a heart attack in Los Angeles. He is now has a star on the St. Louis Walk of Fame. Ten years later, Ray Eames died in Los Angeles in 1988 the day after Charles. Though they are no longer with us, their designs remain extremely influential in the world of architecture and furniture. 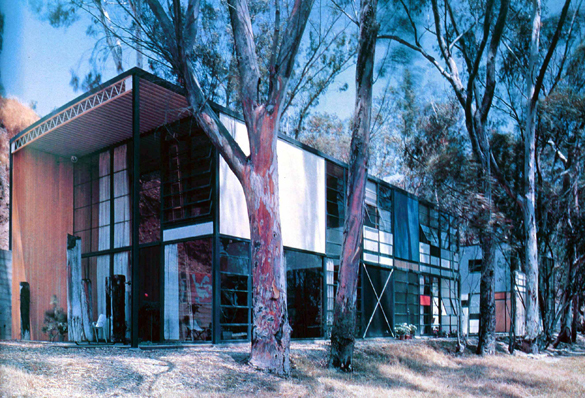 Eames’ house (Pacific Palisades, Santa Monica, California, United States) is unique with its prefabricated elements, including steel, glass asbestos and panels.